New Blawg Sidebar Category: Infotainment? The WSJ and CNN report today, October 2, 2018, that Pres. Donald J. Trump (aka David Dennison) directed his attorney Michael Cohen to seek a restraining order through an arbitration proceeding to prevent Stormy Daniels (aka Peggy Peterson aka Stephanie Clifford) from airing dirty laundry in a TV interview. The WSJ reports that the arbitrator issued a restraining order, which, evidently, did not restrain Ms. Daniels. We have previously posted on March 8, 2018, about the Trump/Daniels arbitration. Above: Video/recording: Comedian Harmonists Sing Quand Il Pleut (Stormy Weather/Ohne Dich). 1933. News about our latest reality show, Stephanie Clifford a.k.a. Stormy Daniels a.k.a. Peggy Peterson v. Donald J. Trump a.k.a. David Dennison, and Essential Consultants, LLC, LASC Case No. BC696568 (filed March 6, 2018) is now splattered across the information superhighway. The lawsuit seeks declaratory relief that a non-disclosure agreement or "hush agreement" created to prevent adult film actress Stormy Daniels from communicating about her relationship with Donald J. Trump a.k.a. David Dennison, is unenforceable. A copy of the secret non-disclosure agreement is attached as Exhibit 1 to the very public complaint. Meanwhile -- and this is where alternative dispute resolution enters into the picture -- President Trump's press secretary Sarah Huckabee Sanders, has announced that President Trump has already won in arbitration, thereby perhaps inadvertently admitting that President Trump, who did not sign the non-disclosure agreement, is the real party in interest seeking to shut up Ms. Daniels. Seth Abramson, in a series of Twitter tweets, has analyzed the enforceability of the arbitration agreement. The enforceability of the agreement is also discussed by Emily Bazelon, David Plotz, and John Dickerson, in their March 8, 2018 Political Gabfest podcast. 1. Is the agreement too ambiguous to be enforceable, because the parties are a shell corporation and/or Donald J. Trump (who is identified in a side agreement). 2. Does it matter that DJT did not sign the agreement, though there is a signature line for him? 3. Is the agreement enforceable, because there is an offer, an acceptance, consideration ($130,000), and a meeting of the minds? 4. Was there a meeting of the minds if the agreement, as DJT's press secretary apparently admitted, is for the benefit of DJT, yet he did not sign it? 5. Can DJT enforce the agreement as a third-party beneficiary? 6. Does DJT need to sue in his name to enforce the agreement on his behalf? 7. Did Ms. Daniels violate the non-disclosure agreement when she filed a public document attaching the NDA as Exhibit 1, rather than filing under seal? 8. How can a shell corporation make representations in the NDA on behalf of DJT, if the shell corporation is not his agent or attorney? 9. Did attorney Michael Cohen violate campaign election law by funneling a $130,000 payment to Ms. Daniels to help DJT win the presidential election, without declaring an in-kind campaign contribution? 10. Did attorney Michael Cohen violate rules of professional ethics by settling a legal dispute without a real client, or without the knowledge of the client, whose fingerprints are not on the agreement? 11. Has the NDA been compromised by public statements of the President's attorney and the President's press secretary, such that it cannot be enforced? 12. How do you feel about the use of NDAs to prevent someone from speaking about the sexual conduct of an important public figure? Is it important that the NDA was entered into just before the election, when DJT was not yet a public official, rather than after the election? Does it matter to you whether the person seeking to speak was a victim, or whether the conduct was consensual? 13. Is enforceability of this NDA, concerning the President, against public interest? 14. Is the million dollar liquidated damages provision in the NDA unenforceable as a forfeiture having no reasonable relationship to the actual injury? Has DJT ever been monetarily damaged by publicity? 15. If an award has been issued against Ms. Daniels in arbitration, how will it now be enforced? Does a petition to confirm the award in court lead to a public circus that will vitiate the benefit of such an award? 16. Are the private lives of important public officials fair game? 17. Was the original sin an effort to blackmail, making enforcement of the arbitration remedies with the help of a private arbitration process more acceptable? Dear readers, please let us know if you spot additional issues worthy of consideration. BONUS: The original Comedian Harmonists, who sing Stormy Weather in its French version in the recording above, were a German harmony ensemble active between 1928 and 1934. They are the subject of an entertaining 1997 German movie entitled The Harmonists, directed by Joseph Vilsmaier. Our blogger's grandfather, Eric Collin, was the second tenor in the group. The Congressional Vote Furthers De-Regulation Of Wall Street. In a NYT article entitled, "Consumer Bureau Loses Fight to Allow More Class-Action Suits," Jessica Silver-Greenberg reports about the October 24, 2017 vote in the Senate to roll back a rule written by the consumer bureau and previously intended to go into effect in 2019. The 51 to 50 Senate vote, in which VP Pence broke the tie, will allow financial institutions to continue to channel consumer complaints into arbitration. The roll-back, which is part of a wave of Republican efforts to deregulate, was favored by financial institutions, the Treasury Department, and the US Chamber of Commerce. The US consumer bureau, consumer advocates, and plaintiff class-action attorneys have opposed the ubiquitous enforcement of arbitration clauses. I posted on November 1, 2015 that Jessica Silver-Greenberg and Robert Gebeloff were authoring a series of special reports in the NYT critical about the use of arbitration clauses to avoid enforcement of plaintiff rights through class-action lawsuits. NYT Article Describes Bank’s Use Of Arbitration With Customers Complaining About Creation Of Sham Accounts. 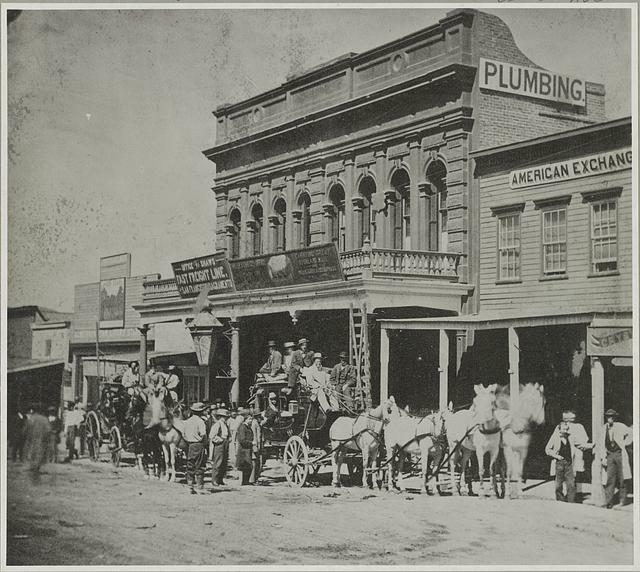 Above: Wells, Fargo & Co.'s Express Office, C Street, Virginia City. 1866. Library of Congress. The NYT, which ran a series of articles in 2015 critical about the spread of arbitration, has published an article dated December 6, 2016, by Michael Corkery and Stacy Cowley entitled, “Wells Fargo Killing Sham Account Suits by Using Arbitration.” The thrust of the article is that Wells Fargo has effectively used arbitration clauses to divert customer lawsuits from the courts to arbitral forums. Is There A Meaningful Distinction Between Contract Enforcement And Contract Formation For Purposes Of FAA Preemption? Kate Howard’s October 26, 2016 post about “Petitions To Watch” in Scotusblog notes that an arbitration case, Tamko Building Products, Inc. v. Hobbs, No. 15-1318, is up for consideration at the conference of October 28, 2016. Petitioner Tamko is trying to come within the rule of Concepcion, which held that courts must place arbitration agreements on “equal footing” with other contracts. In other words, the courts can’t place burdens on arbitration agreements that they couldn’t place on other agreements, absent clear congressional intent to do so. News: Can Wells Fargo Require Customers To Arbitrate Issues Regarding Unauthorized Accounts? Attorney General Of Minnesota Say No, Joining Other Political Figures. On October 4, 2016, Adam Betz reported for the Star Tribune that Minnesota’s Attorney General Lori Swanson opposes Wells Fargo’s use of arbitration clauses to require its customers to arbitrate claims concerning unauthorized accounts opened by Wells Fargo. And the LAT reports that on October 3, Sen. Sherrod Brown (Dem. – Ohio) introduced legislation in Congress to prevent Wells Fargo from invoking arbitration in contracts with customers. The Evidence Supports Mediation’s Selling Points. The Maryland Judiciary has commissioned research to be conducted by independent researchers on the efficacy of mediation with small claims-type cases. The research claims to be “the only research in the country that compares the attitudes and changes in attitudes of participants who went through ADR to an equivalent comparison group who went through the standard court process.” The research also examines the long-term and short term effects of employing different mediation strategies, such as reflecting back the emotions and interests of the participants, and eliciting solutions, offering solutions, and caucusing. The research showed significant benefits for those who went through the ADR process. Participants were more likely to resolve all their issues. They had an increase in their rating of their level of responsibility for the situation. Participants were more likely to be satisfied with the judicial system than others. They were more likely to emerge with a better attitude toward the other side, and with a higher satisfaction with the outcome. The study also found interesting results regarding the strategies employed by mediators. In the short run, reflective strategies seemed to make participants feel more positive, though such strategies seemed not to have a statistically significant effect in any positive or negative outcomes. Frequent caucusing correlated with lower satisfaction, and with a higher likelihood of return to court. Also, “eliciting strategies” – asking participants to suggest solutions, summarizing the solutions, and asking them how the solutions would work for them – were strategies associated with a lower rate of return to court in the long run. Being directive by offering solutions was a less successful strategy than eliciting solutions. Query whether reflecting back the emotions of participants, keeping them all in the same room without caucusing, and avoiding evaluation and directive solutions will work with equal success in more complex mediations. Here is a link to the studies. Jessica Silver-Greenberg and Michael Corkery, who have reported recently in the NYT about how arbitration clauses are spreading throughout consumer contracts, now report in the May 5, 2016 online edition of the NYT, that the Consumer Financial Protection Bureau will seek new rules to prevent lenders from forcing people to agree to mandatory arbitration clauses that bar class actions – a move that could be accomplished without Congressional action. Vigorous opposition can be expected from the U.S. Chamber of Commerce and lenders, as well as other businesses that want mandatory arbitration clauses. Recall the key case that opened up the widespread use of arbitration clauses in consumer contracts is AT&T Mobility v. Concepcion, 563 U.S. 333 (2011), and the rule would not affect cell phone companies. A Circuitous Route To Publication. I posted about SingerLewak v. Gantman on July 31, August 31, and September 1, 2015. This is an interesting case discussing the so-called “public policy exception” that will sometimes justify review of an arbitral award by the superior court – though in the end, not in this case. Previously, the Court of Appeal had ordered the case published in the morning, only to revoke the publication order in the afternoon, when it realized that the time to order publication had expired. The Justices then wrote a letter to the Supreme Court asking for publication. Yesterday, the Supreme Court ordered publication. Ted Bacon, Mike Hensley, and Matt Hansen, my colleagues at AlvaradoSmith, represented SingerLewak, the appellant/plaintiff prevailing on the appeal. I was pleased to see publication was ordered, as I had written the letter to the Court of Appeal requesting publication. Proposed New Exception To Mediation Confidentiality Statutes Would Utilize In Camera Screening Process. On August 7, 2015, the California Law Revision Commission directed staff “to begin the process of preparing a draft of a tentative recommendation that would propose an exception to the mediation confidentiality statutes (Evid. Code sections 1115-1128) to address ‘attorney malpractice and other misconduct.’” For minutes of the meeting, follow the link. The excerpt of the minutes concerning this topic is found at pages 4 to 6. COMMENT: I blogged on April 8, 2012, about legislative efforts to “fix” the mediation confidentiality statutes to allow the introduction of evidence from a mediation in cases involving attorney malpractice or breach of fiduciary duty.